It would make the perfect question for the popular television show “Are You Smarter than a 5th Grader:” What parts of the eye allow us to see? The conventional wisdom: rods and cones. The human retina contains about 120 million rods, which detect light and darkness, shape and movement, and about 7 million cones, which in addition detect color. Without them, or so we are taught, our eyesight simply would not exist. But that might not be true, according to a study — published July 15 in the journal Neuron — that provides new hope to people who have severe vision impairments or who are blind. In addition to providing hope for people with serious vision problems, Hattar’s findings hint that, in the past, mammals may have used their ipRGCs for sight/image formation, but during the course of evolution, that function was somehow taken over by rods and cones. The study also concludes that, far from being homogenous, ipRGCs come in five different subtypes, with the possibility that each may have different light-detecting physiological functions. To conduct the study, the team used a special system to genetically label cells and then “trace” them to the rodents’ brains before subjecting the mice to a number of vision tests. In one, mice followed the movements of a rotating drum, a test that assessed the animals’ ability to track moving objects. In another, the rodents were placed within a “Y”-shaped maze and challenged to escape by selecting the lever that would let them out. That lever was associated with a certain visual pattern. The mice that were blind — they lacked rods, cones and ipRGCs — couldn’t find that lever. But those with only ipRGCs could. 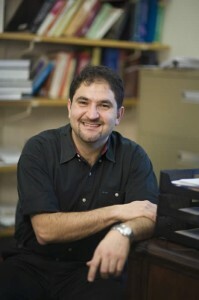 “These studies are extremely exciting to me, because they show that even a simple light-detecting system like ipRGCs has incredible diversity and may support low-acuity vision, allowing us to peer into evolution to understand how simple vision may have originally evolved before the introduction of the fancy photoreceptors rods and cones,” Hattar said. Hattar’s team worked on this study in collaboration with groups led by David Berson of Brown University and Glen Prusky of Weill Cornell Medical College. It was supported by grants from the National Institutes of Health, the David and Lucile Packard Foundation and the Alfred P. Sloan Foundation.